Sixteen others were killed in Indiaafter rooftops or walls collapsed onto them,according to the country's Home Ministry.Chinese media reported one death in Tibet. "This is a really big one,"Prakash Shilpakar, the owner of a handicrafts shop in Kathmandu, told Reuters.Shilpakar was trying to call his parents in the town of Bhaktapur, which was destroyed in the devastating April earthquake. 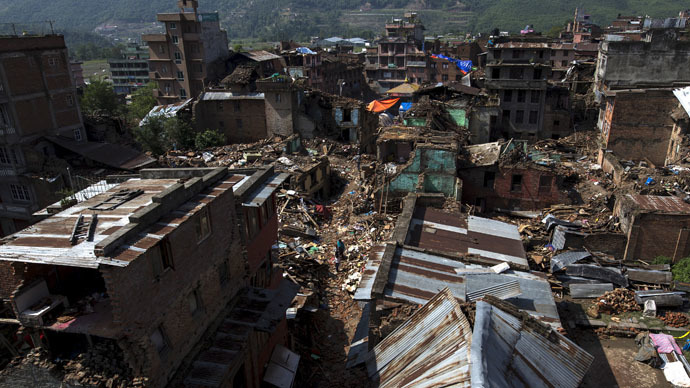 Rescue helicopters have been sent to mountain areas, where landslides and collapsed buildings may have buried people, the Nepalese government said. TheSindhupalchowk and Dolkha districts were the worst hit, according to Home Ministry officialLaxmi Dhakal. The latest tremor struck near the base camp for Everest, and was felt across the country, including the capital, Kathmandu. Everest Base Camp was evacuated after an avalanche caused by the last quake killed 18 climbers. Mountaineers subsequently canceled this year's Everest season.